The North American box art of the game. Splatoon 2 (スプラトゥーン2 Supuratūn 2) is a third-person shooter developed and published by Nintendo for the Nintendo Switch console, and the sequel to the Wii U game Splatoon. The game builds further on the ink-based shooting mechanics introduced in Splatoon, with the general gameplay being indentical, but adds new content including new Weapons, Stages, and a new horde mode named Salmon Run. The game was first teased on 20 October 2016 during the reveal trailer for the Nintendo Switch, and released worldwide on 21 July 2017. Although teased with the reveal of the Switch console, Nintendo did not officially confirm this or any other game showcased in the video as being in development at the time. The title was officially unveiled on 13 January 2017 at the Nintendo Switch Presentation in Tokyo, Japan and demos were playable at Switch hands-on events. A testfire demo was playable March 24–26, 2017. The events of the story mode take place two years after the completion of the first game's Octo Valley mode, while Cap'n Cuttlefish is on vacation with Agent 3. Callie and the Great Zapfish have disappeared and Marie recruits the player, designated Agent 4, to storm Octo Canyon in order to search for them. The Squid Sisters Stories mention the snow globe DJ Octavio was imprisoned in is shattered and Cap'n Cuttlefish's shack is smashed. This mode is set in Octo Canyon, a place similar to Octo Valley from the first game. The events of the Octo Expansion story mode takes place at the same time as the base game's story does. The Octo Expansion is the 'vacation' Agent 3 and Cap'n Cuttlefish are on, which is referenced within the base game's single-player campaign. When Cap'n Cuttlefish and Agent 3 were in Octo Valley, Agent 3 battled against an Octoling that somehow led to both the Octoling and Cap'n Cuttlefish being captured and taken deep underground to an abandoned station in the Deepsea Metro, ran by the Kamabo Corporation. With the Octoling having lost their memory, they are nicknamed 'Agent 8' and team up with Cap'n Cuttlefish to ride the Deepsea Metro and escape the facility, along the way collecting mem cakes, which are physical manifestations of Agent 8's lost memories. Agent 8 and Cap'n Cuttlefish meet mysterious and shady characters such as the Telephone, C.Q. Cumber, Iso Padre and familiar faces such as Pearl, Marina and Agent 3. 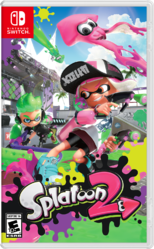 Like its predecessor, Splatoon 2 is a third-person shooter game focused on online multiplayer battles, in which eight players are divided into two teams of four. Players have two main forms and may switch between the two at will: their humanoid form, in which they can use weapons to spread ink and splatter opponents, and their squid form, which they can use to swim through ink at great speed and up walls, recharge the player's ink tank faster (while in their own ink), and hide in their team's ink. Players can also utilize Sub Weapons, such as Splat Bombs, and Special Weapons, such as Splashdowns. In the primary game mode, Turf War, players are awarded points based on the amount of turf (ground) they cover in their team's ink— the team that covers the most territory within three minutes wins the match. Splatoon 2 features both new and revamped stages, weapons (such as the Splat Dualies), special weapons (such as the Splashdown and Inkjet), and gear items, as well as additional character customization in the form of hairstyles and pants. The game also allows for local multiplayer with up to eight people. Certain elements of the Heads-Up Display have also been revamped, showing the weapons each player has and whether their Special Weapons are ready to be used. Judd is accompanied by a new cat with a smaller, younger and near-identical appearance to Judd's, named Li'l Judd. After update version 2.0.0 the max level will be 99 (instead of 50 in the original game). After the player talks to Judd after reaching level 99 the player will have the option to restart at level ★1 and continue leveling up. In addition to the new level cap after the update. Players will be able to change their gear without having to leave the match room. All ranked modes from the original Splatoon returned in Splatoon 2. All three have been changed in at least one way. The Rainmaker shoots large blaster-like exploding shots instead of a large ink tornado. Splat Zones has a new HUD UI that shows how much of the zone is captured. Tower Control now has checkpoints where the tower stops for approximately 5 seconds. Salmon Run is a new co-op mode, in which players collect Power Eggs and Golden Eggs by defeating Salmonids in order to complete missions. League Battle is a new online mode replacing Squad Battle, in which teams of two or four battle other teams to gain points in a two hour period. Private Battles are now available for Local Multiplayer, and a new feature called LAN Play allows docked Switches to play Private Battles on a LAN without an Internet connection. A spectating mode called Spectator View has been added for Private Battles only. On 13 December 2017 in the 2.1.0 patch, the first brand-new mode for Splatoon 2 was introduced. The mode Clam Blitz was added to the Ranked Battle stage schedule, alongside Splat Zones, Rainmaker, and Tower Control. The objective of Clam Blitz is to pick up clams, which are scattered around the stage, and deposit them into the goal near the opposing team's base. The team who scores 100 points by depositing clams, or has the most points scored when the timer runs out, wins the match. Early European box art for Splatoon 2. Early North American box art for Splatoon 2. The front of the reversible cover of Splatoon 2's box art. The back of the reversible cover of Splatoon 2's box art. Early logo for Splatoon 2. Final logo for Splatoon 2. A new map, The Reef, on Splatoon 2 on the Nintendo Switch. New gear, weapons, and hairstyles. Inkrails allow Inklings to travel above the map on Moray Towers. The map overview screen, accessed by pressing 'X' in battle. An Inkling holding large multi-barrel weapons, tentatively named Tenta Missiles. An Ink Storm pouring ink over Starfish Mainstage. The hub for Splatoon 2: Inkopolis Square. Expanded box art/ Promo image for Splatoon 2. An Inkling fighting off one of the new bosses. An Inkling in a new neon Octo Canyon level. An Octoling with new gear holding an Octarian Slosher. Official art of Salmon Run. A Team of Inklings in Salmon Run. A Team of Inklings transporting Golden Eggs to the Egg basket in Salmon Run. A female Octoling (playable) riding the Deepsea Metro. Agent 8 in an Inkjet level within the Octo Expansion. Agent 8 against a lot of Sanitized Octarians. Agent 8 looking at the station smokestacks within the Octo Expansion. A team of enemy Octolings. From July 5 to 17 July 2017 Nintendo of Denmark held a competition with fifteen winners of the prize of four tickets to LEGOLAND valid through the 2017 season. The contestants had to mail in the right answer to the question: "Which colorful shooting-game releases on the 21st July [the same year] for the Nintendo Switch?" and write "Sommerkonkurrence" (summer competition) as the topic to info@bergsala.dk. Three options were given: Super Smash Bros. for Nintendo Switch, Pokkén Tournament DX, or Splatoon 2. The right answer was Splatoon 2. The competition was concluded on the 17th and the winners were contacted through mail. Super Smash Bros. for Nintendo Switch did not exist at the time of this contest and Pokkén Tournament DX was released on 22 September 2017. In Hong Kong, both the Japanese and North American/Oceanian versions are offered in the country's eShop. Ratings were also given out to both versions in South Korea. However, only the North American/Oceanian version has been confirmed for a physical release in the country. ↑ GAME RATING and ADMINISTRATION COMMITTEE - Search results for "스플래툰"
This page was last edited on 6 April 2019, at 08:45. This page has been accessed 700,858 times.